To most, Chiang Mai is known as the heritage city of Thailand, with a geography dotted with temples. 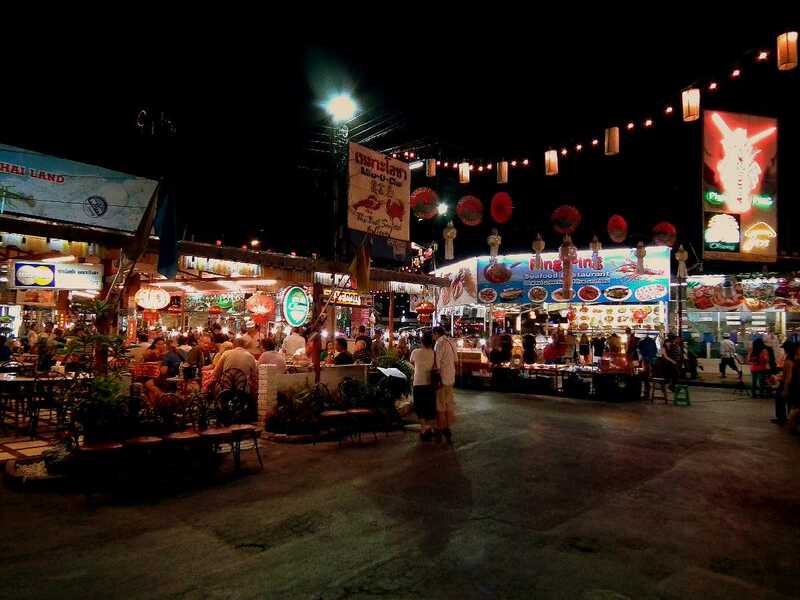 However, unbeknownst to many, there are several night markets in Chiang Mai that come alive after dark. The night markets in Chiang Mai are melting pots of culture, modernity and authenticity. Shops packed with exotic and interesting goods are lined one after the other, selling everything from domestic items to traditional souvenirs to delicious Thai food. Complete with music, entertainment and the lively chatter of people, visiting these markets can be a delight for the senses and a segue into feeling like a local. Perhaps the largest night market in Chiang Mai, the Chiang Mai Night Bazaar is a reservoir of hundreds of shops selling everything under the sun. Sois and streets flanked by shops teem with customers hunting for inexpensive items ranging from handicrafts, clothes, accessories, games, furniture, kitchenware, hardware to gold/silver antiques. Since prices are not fixed, some friendly bargaining is acceptable. Anusarn Market and Kalare Market are among the most popular shopping destinations within the Night Bazaar worth checking out. After an evening of shopping, you can treat yourself to a drink or local foods from the numerous cafes, bars and restaurants near the main street. Ton Lamyai Market is the famous flower market of Chiang Mai. It qualifies as one of the most photogenic places in the city, with the lovely Ping River in the background and the plethora of colourful flowers brightening the fore. Stalls lining the riverside display an array of orchids, roses, chrysanthemums, jasmines and other seasonal flowers at very reasonable rates. The market is popular among locals, especially during festivals and religious events when flowers are purchased in bulk to offer in temples. Since the market doesn't sleep, the air is fragrant with flowers even at night. 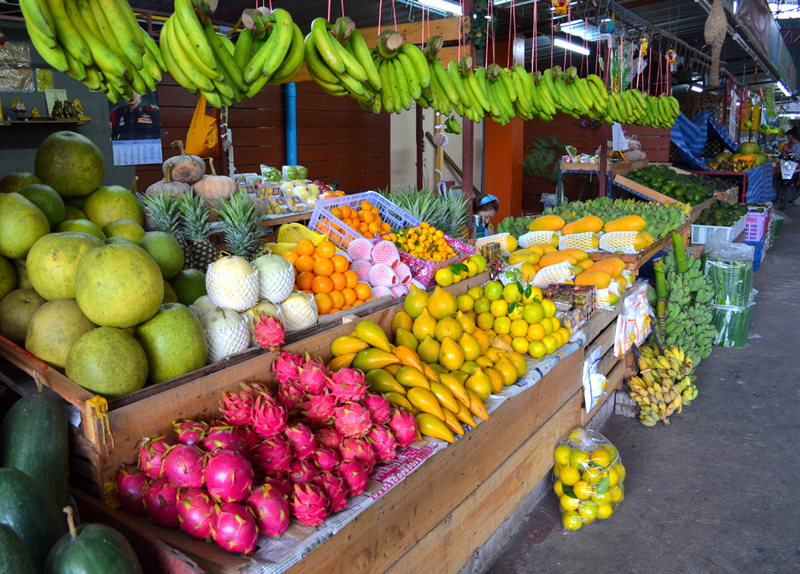 Talat Muang Mai is popular as the ultimate destination for fruit and vegetable shopping in Chiang Mai. Comprising of tons of brilliant wholesale shops, it boasts of a wide ranging collection of fresh produce sold at heavily discounted prices. Locals swear by the authentic quality of the raw foods here. Varieties of mangoes, watermelons, longans, apples, pineapples, papayas, sandalwood, tangarines and tomatoes are stacked along stalls which remain open 24 hours a day. This fruit market is a photographer's paradise, with its brilliant colours and crowds creating attractive frames. The narrow road leading up to the market is best navigable by foot, or even motorbikes. Every evening, the square near the north gate of the old city of Chiang Mai turns fragrant with the smells and sounds of local food cooked in the Chang Puak Gate Market. The shops in this night food market can be seen preparing delectable Thai savouries in large woks and vats. The most sought-after dishes are noodle soup, skewered meat, pork balls, seafood and fresh fruit juices, cooked in traditional Thai styles. Choices of Japanese and Chinese cuisines are also available here. Prices are incredibly cheap, going even as low as THB 10, so you can satiate your taste buds to your heart's content without burning a hole in your pocket. Also known as the Wualai Market, the Saturday Walking Street is one of the most wonderful shopping experiences in Chiang Mai. It is less popular than its Sunday Market counterpart on Ratchadamnoen Road, which lends it a quiet charm sans the bustle of tourist crowds. Shops sell an assortment of handmade goods, handicrafts, locally produced items and silverware exclusive to this night market. Massage parlours are also present, which offer relaxing massages for weary feet. With soft lights emanating from the stalls, you can enjoy a stroll through the streets while snacking on freshly prepared snacks, for an exquisite Thai experience. The Sunday Walking Street is a night market that seems nothing short of a carnival. Every Sunday, the Ratchadamnoen Road is embraced with a jovial ambience as vendors begin setting up shop early in the evening. The items on display are mostly authentic and unique, with selections varying from handicrafts, ornaments, apparel, postcards and other tidbits. Since the market is a common local centre for entertainment and cultural programs, it is always buzzing with live music, artists and performers. You can also rest your feet at the massage booths which offer quick foot massages at nominal prices or indulge in some lip-smacking Thai delicacies from street vendors. Among the largest and most favourite local shopping destinations in Chiang Mai, the Warorot Market (or Kad Luang) is heaven for food lovers and culinary experts. Most shops in the supermarket are dedicated to packaged food, condiments for Thai delicacies, sauces, and local snacks like sai oua, cap moo and khao soi noodles, all available at lower prices as compared to other markets in the city. Several other shops in the building also sell run-of-the-mill clothes, domestic ware, cosmetics and accessories. Since it is majorly a market frequently accessed by locals, the place is free from tourist traps, where you can have an authentic experience of immersing yourself in Thai culture. What to buy in Chiang Mai? If you are planning to shop in Thailand, Chiang Mai is the place to bring an empty suitcase. Known as the cultural centre of Thailand, the markets of Chiang Mai are the abode of artistic expression for local artisans through handicrafts, silverware and fashion that blend ancient traditions with contemporary techniques. An especially good buy in Chiang Mai is Lacquerware, a decorative article which is typically made of wood and coated with lacquer. The traditional handicrafts of the region include unique gold-on-black lacquerware pieces such as bowls, decorative boxes and jewellery. Additionally, there is a large variety of local specialities available at these Night Markets which include handmade paper umbrellas, embroidered bags, silks, ceramics and other handmade goods produced by local hill tribes. One can also buy silverware and jewellery from traditional silver shops. One can also find shops filled with wood carvings and leather sandals which are a hit amongst the tourists. Lastly, no market in Thailand is complete without the availability of designer knock-offs, cheap watches and cheesy souvenirs to take back home. Since most markets are situated on narrow roads and cramped alleys, you can avoid taking cars or heavy vehicles due to lack of parking space. Instead take a tuk-tuk, available for as low as THB 20 - THB 30. Beware of pickpockets and take care of your wallets and other valuable goods. You can engage in some light bargaining, but don't be rude to vendors in the process. Be friendly, smile, and talk to them amicably. These markets are very large and crowded. Wear comfortable shoes, since you may end up spending quite some time here. Be careful of tourist traps and merchandise sold at high prices. Always check in 2-3 shops before buying what you want, since many shops sell the same things at different prices. Food vendors and cooks use a variety of meats and condiments in their dishes. Double-check the ingredients in your meal, especially if you are a vegetarian or have allergies. Every night once the hustle of the city dies down, the Night Bazar comes to life. Between sunset and midnight hawkers, vendors and shoppers jam the footpath of Th Chang Khlan, from Th Tha Phae past Th Loi Kroh. The Night Bazaar is heaven for those who love a good bargain. Filled with designer label knock-offs and souvenirs, one can haggle away for the best offer because the market has numerous shops guaranteed to offer what one seeks to find. Vendors sell home décor, knitted caps, carved soaps and other cottage-industry goods too. Regardless of whether you have bargaining skills or not, it is always advisable to ask if they can lower the price. Even if they refuse your bargain, you can generally get 10-20 baht off just by asking the simple question. The quality isn't always top notch, the prices aren't especially tempting, and it is very crowded, but the market's appeal lies in the sheer variety of goods on offer. While the night markets in Chiang Mai may be popular, the city also has some other markets that pop up in the evening. As evening approaches, temporary stalls and food carts start lining up across the streets and the offer a plethora of food options. Popular and cheap options include sticky mango rice, fruit shakes and local Thai snacks. For those looking for an authentic local experience, make your way towards Chiang Mai University, near the main campus entrance, where you will find the Chiang Mai Complex. Check out the latest Thai fashions, jewellery, electronics and dorm room decor options for university students. You are unlikely to encounter any foreigners here. Instead, the place is bustling with Thai students in their uniforms, enjoying their incredibly cheap traditional Thai noodle dishes. The Thai-style barbecue called 'Gai-Yang' and hotpot that you cook at the table are particularly famous here. Post an authentic meal; one can head towards the nearby trendy Nimmanhaemin Road for a drink or two. The Night Market has something to offer for everyone when it comes to food; there are Italian, Japanese, Indian options apart from the global food court Kalare, all available at low prices. How to reach Chiang Mai? Located in Northern Thailand, Chiang Mai is an hour away from Bangkok by flight. The Chiang Mai International Airport is situated about 3 kilometres south-west of the city centre, roughly a ten minutes drive. There are taxis, buses and other local transport options available to travel between the city and the airport. There are daily buses that operate from the North Terminal (Moh Chit) in Bangkok to Chiang Mai where the Arcade Bus Station is the hub from other destinations. Travelling by bus takes anywhere between 9 to 12 hours from Bangkok. These include both government-run buses and buses operated by private transport companies. The Chiang Mai Train Station is about 3 kilometres east of the city centre, and there are daily trains that operate from Bangkok's Hualamphong Train Station to the Chiang Mai Station which take about 12 to 15 hours to reach Chiang Mai. The train journey from Bangkok to Chiang Mai is relatively comfortable, and one has the option of travelling either first or second class. However, it is advisable to book the tickets in advance to avoid the last minute rush and disappointment. A great way to explore the countryside is to travel to Chiang by hiring cars for self-drive. One can rent vehicles from several places in Bangkok as well as the city centre at Chiang Mai and the Chiang Mai International Airport. The most important detail is that Thailand is a left-hand drive country and it is mandatory to have an international driving license to drive in Thailand. These night markets in Chiang Mai are not just locations to shop at, but also cultural gatherings where you can immerse yourself in Chiang Mai's local events. They are great places to find out about traditional food, habits and trends, while also purchasing them at extremely reasonable prices. So do make it a point to visit these markets for some never-seen-before sights.